One Minnesota pediatrician has written an concise response to the advertisement, and has made it SUPER EASY for your to add your voice to the cause, as well. If you visit AMC Corporate Customer Service and you agree with Dr. Jacobsen, you can simply click a button that says “I have this problem too” to speak out against fallacious anti-vaccination rhetoric. There is also a place to add comments to share your own thoughts with AMC. AMC has every right to run these ads. I; however, will go out of my way to not support any company that runs anti-vax campaigns. As with any controversial topic, take a minute to critically consider the arguments. I happen to believe that not vaccinating against the flu is selfish, dangerous decision. 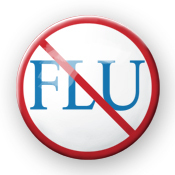 If not for you personally, then for the vunerable people around you (old people, immunosuppressed people, babies too young to receive the vaccine) who may catch flu from you. The flu isn’t just an inconvenient achy, sick-feeling cold thing from which everyone can bounce right back – people die of the flu, and encouraging fear of vaccinations is a public health danger that we should not condone. Quick update from the road: AMC will NOT be running the anti-vax advertisement AMC will not be running the anti-vax advertisements!. 2344 people have weighed in at last check. Skeptical activism at work, well done!